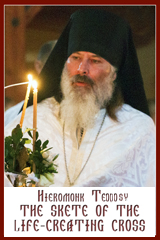 Venerable Maron the Wonderworker and Hermit; February 14. Troparion (Tone 4): From your childhood you befriended wisdom,* O God-inspired Cyril. * Beholding her as a pure virgin all radiant,* you took her as a bride for yourself,* and as with beads of gold* she adorned your mind and soul. * O blessed Cyril,* like your namesake of Alexandria* we have found you wise in name and truth. 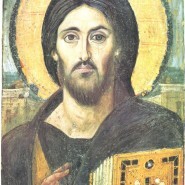 Kontakion (Tone 2): With teaching that was sound and divinely inspired* you enlightened the world as with luminous rays. * Flashing like lightning and surrounding the world,* you scattered the radiant word of God* in the west, the north and the southern lands,* bringing light to the world with your wonders, O blessed Cyril. Prokimenon (Tone 7): Precious in the sight of the Lord* is the death of His venerable ones (Ps 115:6). Epistle (Heb 7:26-8:2): Brethren, it was fitting that we should have such a high priest, holy, blameless, undefiled, separated from sinners, and exalted above the heavens. Unlike the other high priests, he has no need to offer sacrifices day after day, first for his own sins, and then for those of the people; this he did once for all when he offered himself. For the law appoints as high priests those who are subject to weakness, but the word of the oath, which came later than the law, appoints a Son who has been made perfect for ever. Now the main point in what we are saying is this: we have such a high priest, one who is seated at the right hand of the throne of the Majesty in the heavens, a minister in the sanctuary and the true tent that the Lord, and not any mortal, has set up.